The Minister presented information on the Moko eradication and compensation Programme to the members of Parliament last week. 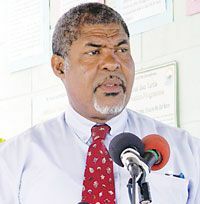 Daniel stated that the Moko disease was officially identified in St. Vincent and the Grenadines in May of 2007 and has affected many areas, including Richland Park, Lowmans, Greiggs, Chapmans, and Vermont. He said that the Ministry of Agriculture, Forestry and Fisheries has treated approximately 248 acres of bananas, 20 acres of plantain, along with other species of plants. Daniel stated that to date $1,713,335.50 has been paid out to farmers in compensation in 2007 and 2008. The Minister said that he is satisfied that his Ministry is working hard to keep the disease under control. He said that due to the longevity of the bacterium, even without a host, there will be need to continue the present mode of operation for sometime to come. The Minister stated that the Ministry of Agriculture would like to encourage farmers to continue to follow the protocols set in place to manage the disease as this will ensure the continued reduction in new occurrence of the disease and limit the spread of it to new areas.